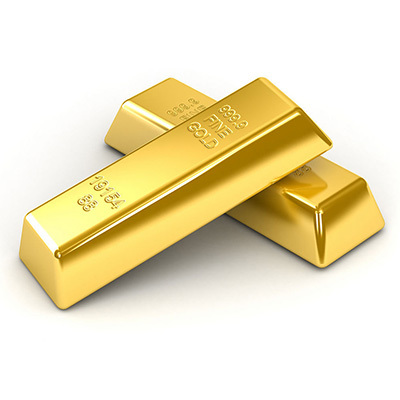 Gold kilogram bars are .9999 fine (99.99% pure) and contain 32.148 troy ounces each. Picture is a likeness only. Orders will be filled with bars from LBMA-listed manufacturers. Actual brand may vary from the picture above. Available for storage in New York, Salt Lake City, Zurich, London, Sydney, Singapore, Toronto and Ohio. These gold bars are .9999 fine (99.99% pure). Picture is a likeness only. Orders will be filled with bars from LBMA-listed manufacturers. Actual brand may vary from the picture above. 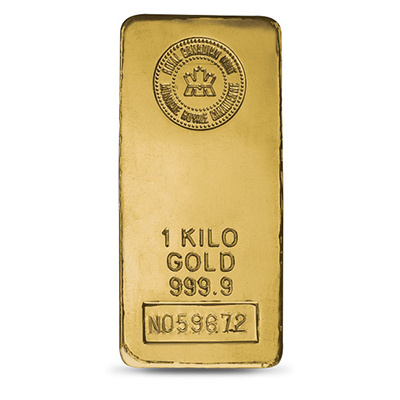 Gold 1oz bars are .9999 fine (99.99% pure) and contain one fine troy oz of gold. Picture is a likeness only. Orders will be filled with bars from LBMA-listed manufacturers. Actual brand may vary from the picture above. Available for storage in New York, Salt Lake City, Zurich, London, Sydney and Singapore. Gold 400 oz bars (variable weight) maintain a fineness of at least .999 purity (99.9% pure) and contain approximately 400 troy ounces each. Picture is a likeness only. Orders will be filled with bars from LBMA-listed manufacturers. Actual brand may vary from the picture above. Available for storage in New York, Salt Lake City, Zurich, London and Toronto. Gold 100 oz bars (variable weight) maintain a fineness of at least .999 purity (99.9% pure) and contain approximately 100 troy ounces each. Picture is a likeness only. Orders will be filled with bars from LBMA-listed manufacturers. Actual brand may vary from the picture above. 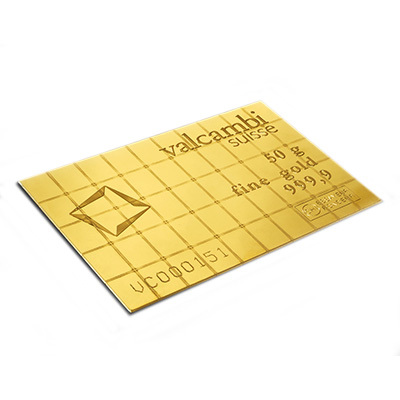 Valcambi CombiBars are an investment product manufactured with accurate constructed predetermined breaking points and therefore can be separated easily without any loss of material. 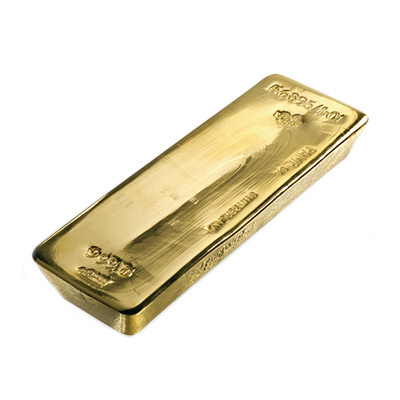 Each 50 x 1g gold bar is 99.99% pure. 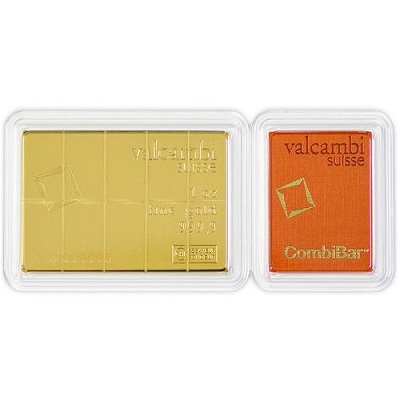 These bars are conveniently scored to separate into 10 one-tenth ounce bars of 99.99% pure Swiss gold. This unique set presents 25 Fortuna ingots weighing 1-gram each, ingeniously packaged within interconnecting CertiPAMP units that may be snapped off from the set as desired. When removed, each securely sealed ingot maintains its individual certification and unique identity. 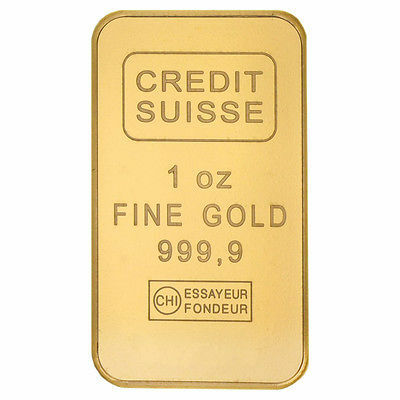 Each sealed 1g gold bar is .9999-fine. 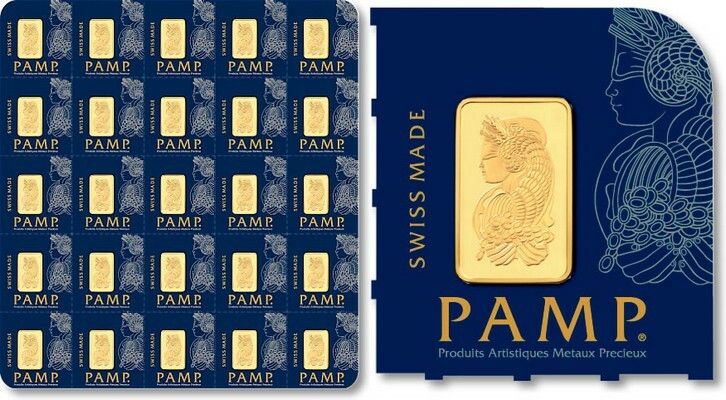 The 1oz PAMP bar is .9999 fine Gold and comes enclosed in a clear protective case that includes an assay card, guaranteeing the gold weight and purity. 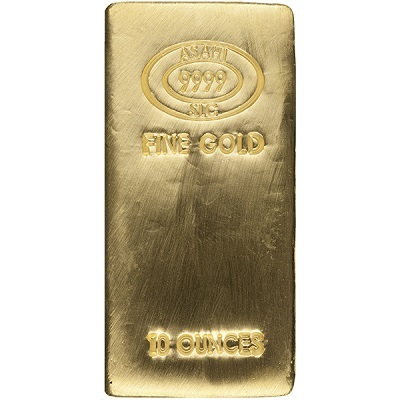 The Gold 10oz Pamp Fortuna Bar is .9999 fine Gold and comes enclosed in a clear protective case that includes an assay card, guaranteeing the gold weight and purity. The bar is stamped with the Roman goddess of prosperity and all her mythical features. 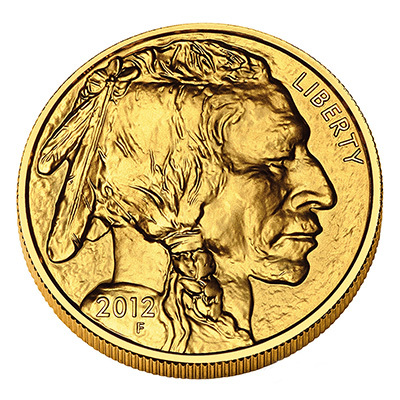 Authorized by Congress and first minted in 2006, American Buffalo Gold Bullion Coins are the first 24-karat, pure .9999, fine, gold coins produced by the US Mint. Picture is a likeness only. Authorized by Congress in 1985 and first minted in 1986, American Eagle Gold Bullion Coins are created according to the durable, .9167 fine or 22-karat standard established for circulating gold coins 350 years ago. Picture is a likeness only. Available for storage in New York, Salt Lake City, Zurich and Sydney. 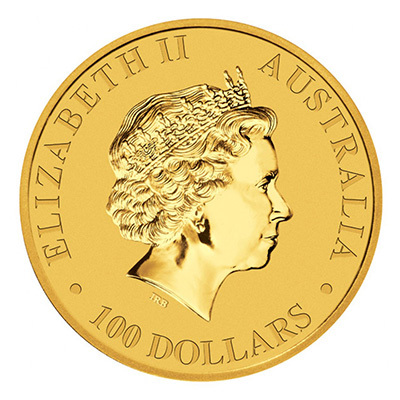 The Australian Gold Kangaroo is one the few bullion gold coins with a fineness of 99.99% (24K purity) that changes its design every year, just like the Chinese Gold Panda. The Australian investor coins are recognized worldwide making them highly liquid. Picture is a likeness only. 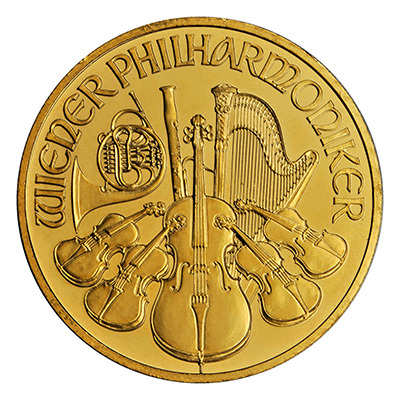 The Philharmonic bullion coins, produced by the Austrian mint are available in 24-karat gold, pure .9999, fine. Because the Philharmonic coins have worldwide recognition, they can be traded wherever major bullion coins are sold, making them very liquid. Picture is a likeness only. 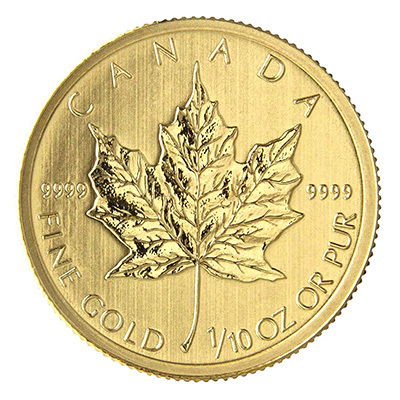 The gold Maple Leaf coin is the world's most popular pure gold coin. Since their introduction in 1979, over 20 million troy ounces have been sold. It is the first bullion coin to achieve the heightened standard of .9999 fine. Picture is a likeness only. Available for storage in New York, Salt Lake City, Zurich, Sydney and Singapore. 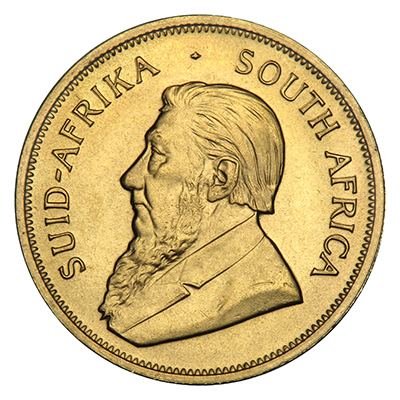 The Krugerrand, introduced in 1967, is the most widely owned bullion coin in the world with over 46 million ounces in circulation. The coin is .916 fine, or 22-karat. Picture is a likeness only. 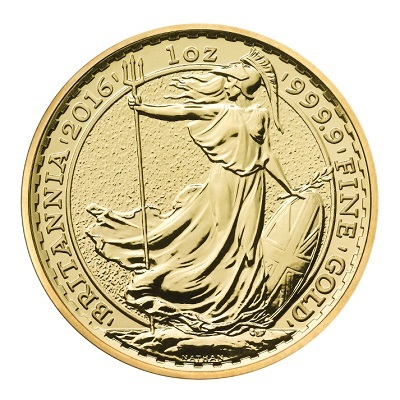 The Gold Britannia is a sovereign coin backed by the British government. The front of the coin is of her Majesty Queen Elizabeth II. The reverse side is the legendary figure of Britannia holding a trident and shield. It is 1oz of .9999 fine Gold. Authorized by Congress in 1985 and first minted in 1986, American Eagle Gold Bullion Coins are created according to the durable, .9167 fine or 22-karat standard established for circulating gold coins 350 years ago. 1/2 coins contain .50 troy ounces each. Picture is a likeness only. 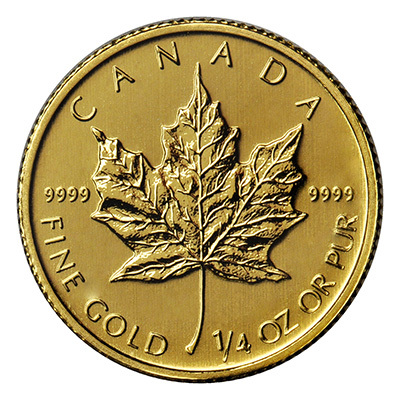 The gold Maple Leaf coin is the world's most popular pure gold coin. Since their introduction in 1979, over 20 million troy ounces have been sold. It is the first bullion coin to achieve the heightened standard of .9999 fine. 1/2 coins contain .50 troy ounces each. Picture is a likeness only. Authorized by Congress in 1985 and first minted in 1986, American Eagle Gold Bullion Coins are created according to the durable, .9167 fine or 22-karat standard established for circulating gold coins 350 years ago. 1/2 coins contain .25 troy ounces each. Picture is a likeness only. 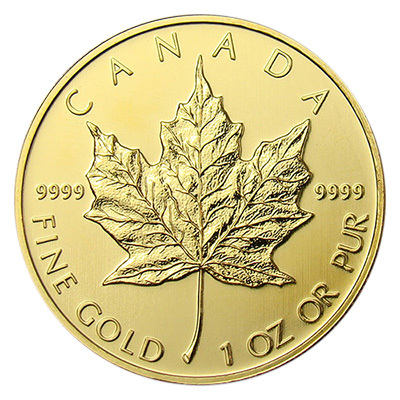 The gold Maple Leaf coin is the world's most popular pure gold coin. Since their introduction in 1979, over 20 million troy ounces have been sold. It is the first bullion coin to achieve the heightened standard of .9999 fine. 1/4 coins contain .25 troy ounces each. Picture is a likeness only. According to the durable, .9167 fine or 22-karat standard established for circulating gold coins 350 years ago 1/10 coins contain .10 troy ounces each. Picture is a likeness only. 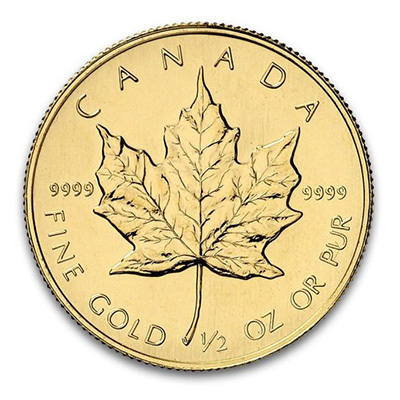 The gold Maple Leaf coin is the world's most popular pure gold coin. Since their introduction in 1979, over 20 million troy ounces have been sold. It is the first bullion coin to achieve the heightened standard of .9999 fine. 1/10 coins contain .10 troy ounces each. Picture is a likeness only. 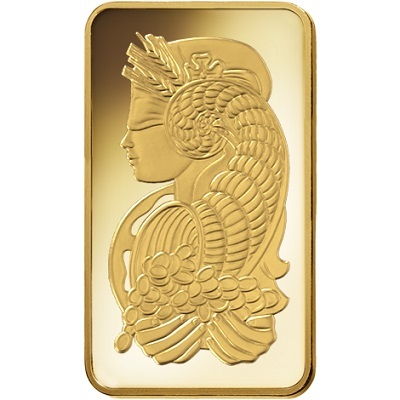 Gold kilogram bars are .9999 fine (99.99% pure) and contain 32.148 troy ounces each Picture is a likeness only. Orders will be filled with bars from LBMA-listed manufacturers. Actual brand may vary from the picture above. 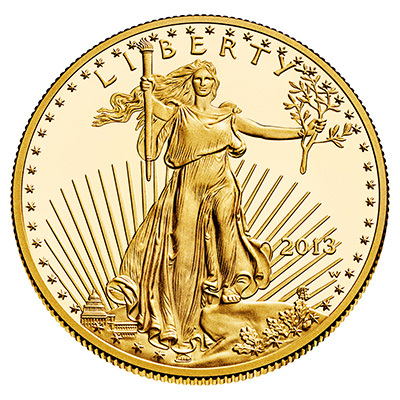 Authorized by Congress in 1985 and first minted in 1986, American Eagle Gold Bullion Coins are created according to the durable, .9167 fine or 22-karat standard established for circulating gold coins 350 years ago. 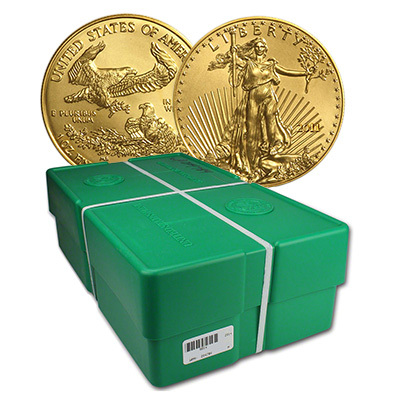 The monster box contains 25 sealed tubes (each containing 20 coins) for a total of 500 troy ounces. Picture is a likeness only.